The Teclast T20 is a new Android tablet from China that, starting at around 200 US Dollars, offers quite a lot of interesting features. In fact, we get a full metal body, a high-resolution 10.1-inch display, integrated 4G and a fingerprint scanner. Additionally, the tablet features an Helio X27 deca-core processor, 4GB of RAM and a 64GB internal storage. But how good can it be in real life? I’m Andrzej for MyNextTablet.com and this is my Teclast T20 review. By the way, usually, you have to import the Teclast T20 from China. I got my review unit from GearBest and they deliver almost worldwide. Usually, you can get it at around 215 US Dollars. The design and build quality of the Teclast T20 is surprisingly high-end. In fact, it features a full metal body and is well build. At the same time, it is just 7.5mm thin but weighs 550g which is a bit much. On the back, we get a fingerprint scanner. Yes, the position is a bit unusual. Actually, it is not too bad at all. If you hold the tablet normally in landscape mode, the fingers kind of rest naturally on the fingerprint sensor. Compared with the sensors of other manufacturers, the one from Teclast is not as fast. But it is precise and works as it should. The fingerprint scanner also supports gestures to replace the recent apps and back buttons. We get a 13-megapixel camera on the back and the front-facing webcam has the same resolution. Considering this is a China tablet, the quality of both cameras is pretty good. But like with pretty much all tablets, most smartphones offer a much better picture quality. Well, it is fine for snapshots and video chats. On the sides, we get a USB C port, a standard headphone jack, and a microSD card slot. You can use that one to insert a SIM card as well. I tried it with an O2 SIM in Germany and did manage to establish a solid LTE connection. However, compared to my Honor Play smartphone, the LTE speed was only half as fast. So, if you have connection issues already, it certainly will not get better with this tablet. The Teclast T20 has two speakers on the sides and the quality acceptable and even better than some other tablets at this price point. Well, while the sound quality is alright, it certainly is not great. Especially when you turn up the volume voices can sound a bit scratchy. 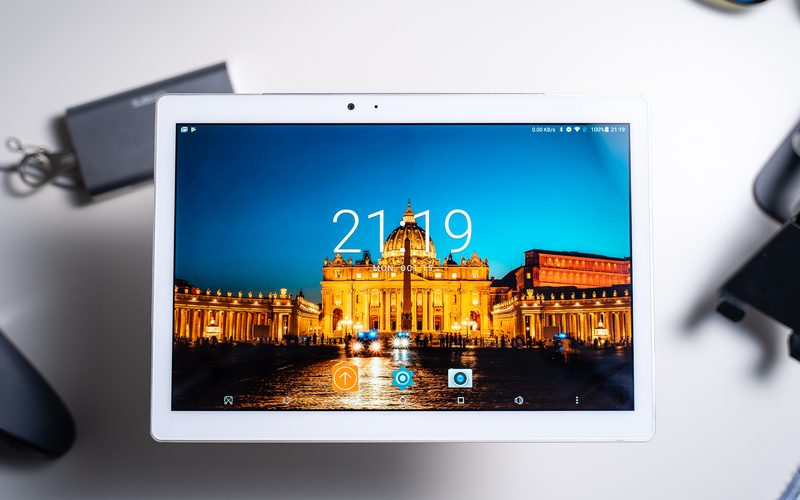 A major highlight of the Teclast T20 is its 10.1-inch display. The screen features a high resolution of 2560 x 1600. Because of that, texts and icons look very sharp. Usually, you have to pay much more for such a high-resolution screen. I also like that the display is laminated. It is an IPS panel with good viewing angles. And it even is bright enough to use comfortably outside. While most aspects of the screen are really good, I did notice that the color reproduction is not as good as on the 2018 iPad. Colors look very saturated, a bit too saturated. And the screen has a slight blue-green color cast. In the settings, you can adjust the colors a bit though. Oh, and you certainly will see fingerprints on here. As with most competitors, the Teclast T20 has a blue-light-filter and even a black and white mode. Inside the Teclast T20 sits a MediaTek MT6797T Helio X27 SoC. That is a deca-core chip with ten cores in total. Two of those are clocked at up to 2.6GHz. Additionally, we get 4GB of RAM and a 64GB internal storage. The results of this Helio X27 chipset in benchmarks like Geekbench 4 and AnTuTu are excellent. In the last one, it even is faster than most Android tablets. Well, except for some flagship ones from Huawei and Samsung. While that is awesome, in real life the performance is not as good and more comparable to a standard middle-class tablet. And that is what the price reflects anyways. I played PUBG Mobile on here and with lowest settings the game runs quite nicely. Actually, I would even call it playable when you set the graphics to balanced. But you will notice some minor lagging from time to time. As I said, I still think its playable. Other games like Into The Dead 2 run great at medium settings too. And they look great on this display. But again, if you set the graphics to high, there is too much stuttering. Games like Shadow Fight 3 and Asphalt 8 run smoothly too and look nice. So, considering the price, the gaming performance is pretty good. It is a bit disappointing that the Teclast T20 is still running Android 7.1 Nougat. While GearBest is promising an update to Android 8.0 Oreo on their website, I’m not totally convinced. A lot of famous brands tell me all the time at trade shows that they will update their tablets. But they never do. Well, maybe it will be different here but I cannot promise anything. At least Android 7.1 Nougat is not customized that much. Yes, out of the box, there is no app drawer. But besides that, it kind of is vanilla Android. Everything runs smoothly and the Google Play Store is pre-installed too. Like with most China tablets, the Teclast T20 does not support the necessary DRM standards to watch Netflix in HD or higher. In fact, you can’t even find it in the Play Store. That is not a big problem though because you can get the APK from the official Netflix support website and then it works great. But again, you cannot watch Netflix in HD. Obviously, other videos like YouTube do work in 1080p or even 1440p since we have such a high-resolution screen here. So, while the software is not ideal, it is totally fine. Let’s take a look at its battery life. That is a major weakness of most China tablets and the Teclast T20 does not stand out here. In my battery test, it got a runtime of just 8 hours. For that test, I’m always looping an HD video at 50 percent brightness. Even compared to other tablets in this price range, the battery life is very weak. If you stream YouTube and Netflix you probably won’t get more than around 6 hours of runtime. However, if you use it normally from time to time you only have to charge it every two days or so. So, how good does the Teclast T20 score in my review? Considering the price, especially the display but also the build quality are great. While the performance is not as good as the benchmarks suggest, it is good enough for most games. And I really like that we are getting a fingerprint sensor on the back. Usually, we don’t get one at all at this price. It is a bit sad though that the battery life is very weak. And it would be nice to get Android 8. Well, maybe we really will get an update. I also wish the LTE reception would be better, but at least we do get 4G. Alright. So, I can recommend the Teclast T20 if you don’t want to spend much over 200 US Dollars and are looking for a high-resolution screen, a solid performance, and a fingerprint scanner. And, if you want to use 4G from time to time. Since it is so inexpensive, I think the Teclast T20 is a good value overall. But as always, let’s take a look at a couple of alternatives. Similar priced is the Huawei MediaPad T5 10. The real-life performance is very similar and it is well built too. Oh, and we do get Android Oreo. Compared to the Teclast T20, the screen has a much lower resolution. And we don’t get a fingerprint sensor. If you don’t need that and can live with a full HD resolution, the MediaPad T5 10 is a great alternative. If you want to save some money, you can also check out the Amazon Fire HD 10 and Teclast M20. Both are around 50 Dollars cheaper – but a bit weaker too.